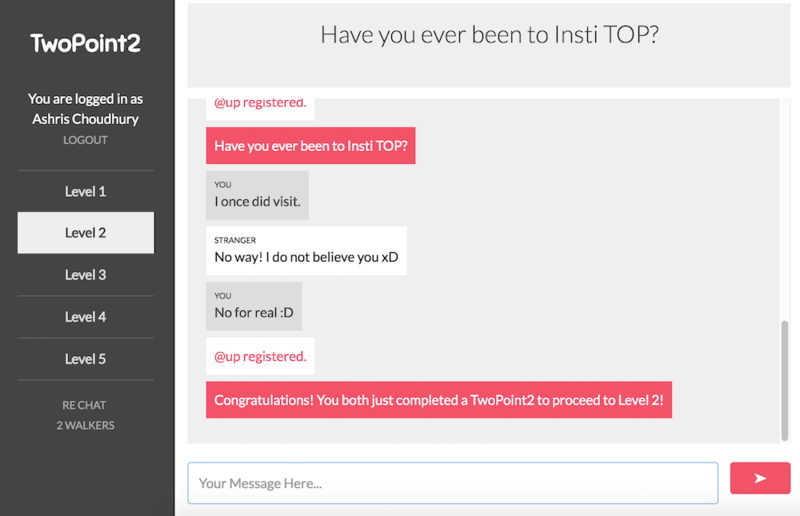 Gamified messaging platform for anonymous users to chat with each other with game like features like level ups, reveal unlocks and theme based questions. 2.2 is the 2.2 km long circular road in IIT Kharagpur encircling the student halls of residences. Every evening, 2.2 witnesses some of the most memorable conversations: some philosophical, some random, some potential startup ideas and sometimes deep moving conversations. 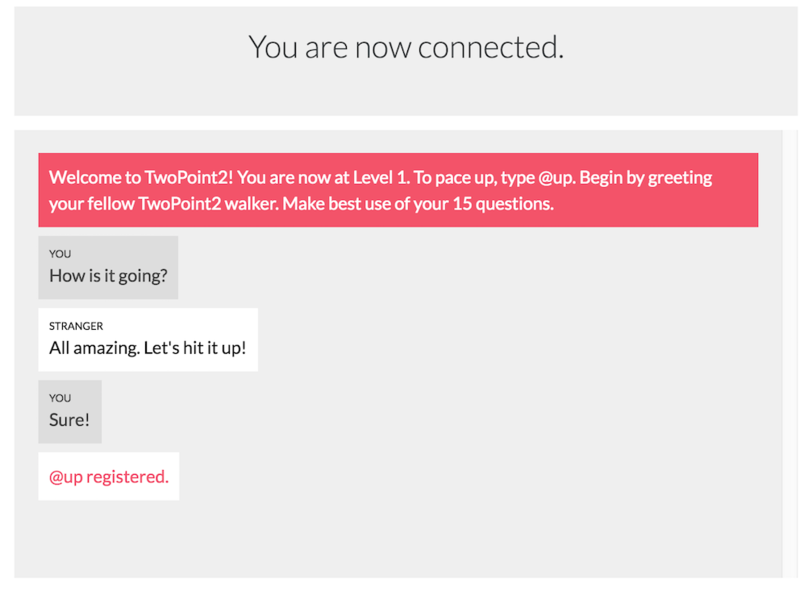 TwoPoint2 is the virtual 2.2 walk through which students can interact with each other anonymously as the interface itself guides them through the conversations. The tool was built on NodeJS with the MEAN Stack. The app became viral with 1200 users in only 3 days. User dashboard after logging in through Google account. The interface informs the user about the current status with the staus bar on the top. The rules are displayed on top right, level progress block is placed to the left and a special box called media box is placed to the bottom right where a video appears whenever a YouTube link is shared. User get connected automatically to other random users. @up is triggered whenever a user types '@up'. The other user is not notified. 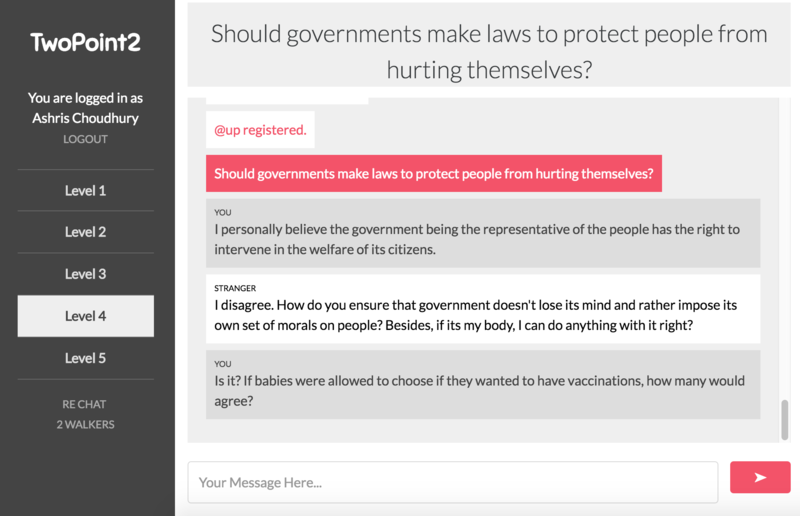 When both users have registered @up, a question is shot at both of them. The questions increase in seriousness as the level progresses. Question pops on mutual @up-ping. The questions initially are very meant to break ice and hence are pretty non-confrontational and general. 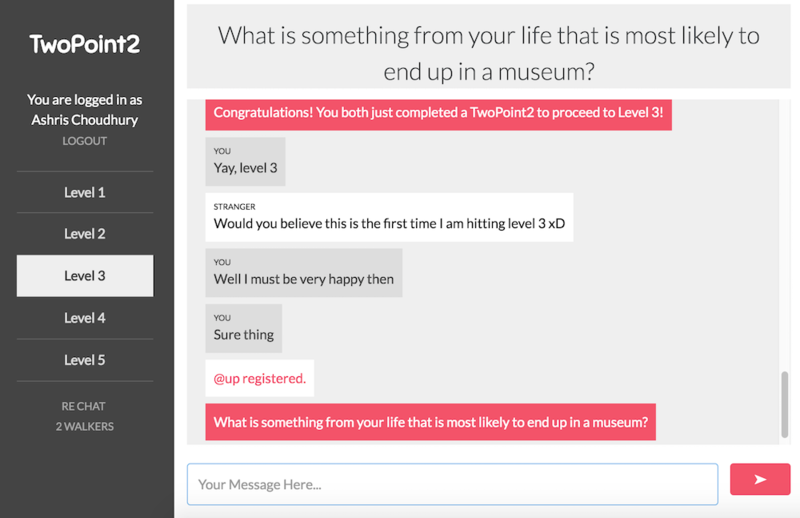 Level rises when both players have answered three questions together. The level rises and the white marker moves in the level block to the left. As the level rises, questions become more and more personal. 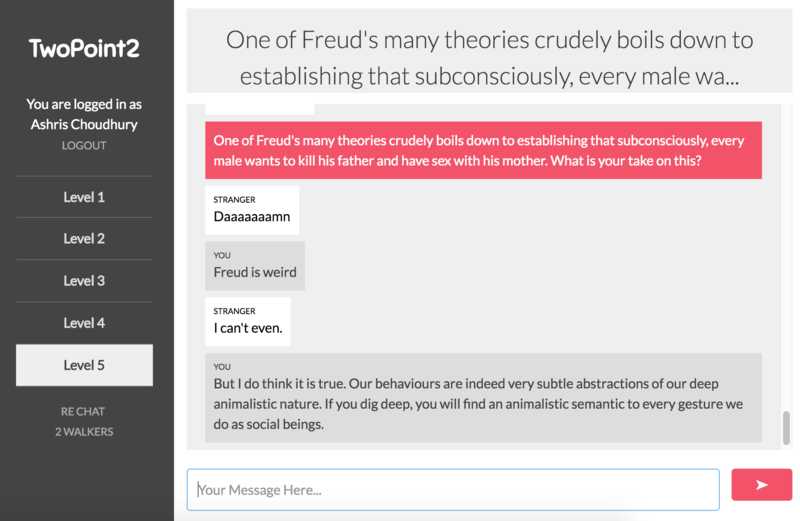 Questions gradually become more personal as level rises. Questions can get very serious evoking a deep conversation. and the questions can get pretty unorthodox too which one wouldn't be expecting to discuss with a stranger. 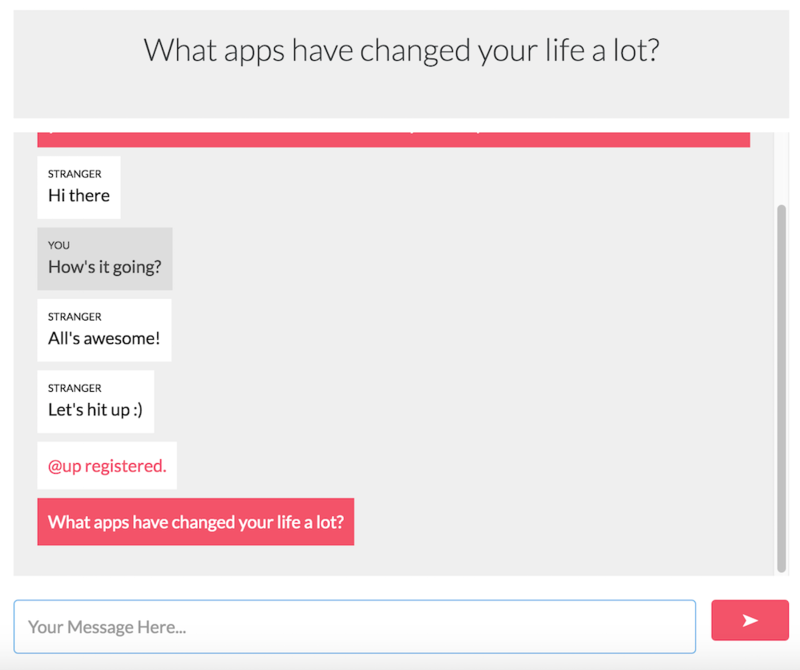 As the users reach Level 5, they can share their identity with mutually registering @reveal. The app was loved by the students in my college. I plan to gradually develop the idea to incentivize good conversations through reputations and added features of scores to extend the gamification.